If you are looking for a new book this fall, check out a few suggestions below – these books are great reads, and the authors share tips to help improve brain health. 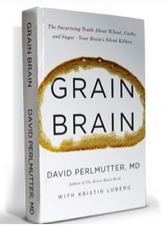 “Grain Brain” by David Perlmutter, M.D. Renowned neurologist David Perlmutter, M.D., explains what happens when the brain encounters common ingredients found in your daily bread and fruit bowls, why your brain thrives on fat and cholesterol and how you can help to spur the growth of new brain cells at any age. He offers an in-depth look at how we can take control of our brain health through specific dietary choices and lifestyle habits. “Boost Your Brain” by Majid Fotuhi, M.D., Ph.D.
Based on cutting-edge science, “Boost Your Brain” is internationally recognized neurologist Majid Fotuhi’s complete program to potentially increase brain size and help to support brain function, including memory, creativity, comprehension and concentration. “Our brains don’t have to decline as we get older,” argues Dr. Fotuhi. 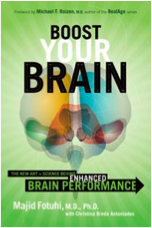 “Depending on the things we do or neglect to do, we can actually measurably improve our brain speed.” In “Boost Your Brain,” the founder of the NeurExpand Brain Center and host of the PBS series “Fight Alzheimer’s Early” offers a three-month brain-optimization program.